Tara Saracuse is a graduate of the Creative Writing program at the University of Victoria. 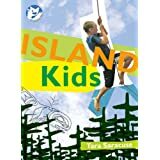 Island Kids is Tara’s first book – and she hopes it is the first of many. Hear about unforgettable kids as they outrun a cougar on Salt Spring Island and more. The VCLR is open to the public. Members free, drop-ins $5, students $4. Meetings are held at the Nellie McClung Branch Library, 3950 Cedar Hill Road, at 7:30 pm. Come early and browse the bookseller’s table, and bring a friend! International Picture Book Swap happening now!